MAC In the Groove collection was released in Australia on Monday 07/26 but I wasn't even aware until Wednesday, by which time, the coveted Stereo Rose MSF (that's mineralise skin finish for those not accustomed to acronyms) was sold out nation wide (I was told later that it sold out in David Jones and Myer Melbourne by Monday lunchtime and nationally by Tuesday lunchtime - I had no chance of picking one up really). So as consolation, I picked up Petticoat MSF to take home with me. Petticoat is essentially a light rosy pink shimmer powder with burgandy, bronze and gold veining running through. Application wise, depending on whether your powder has alot more veining of a particular colour, you can get a few shades from this one product (talk about versatility). 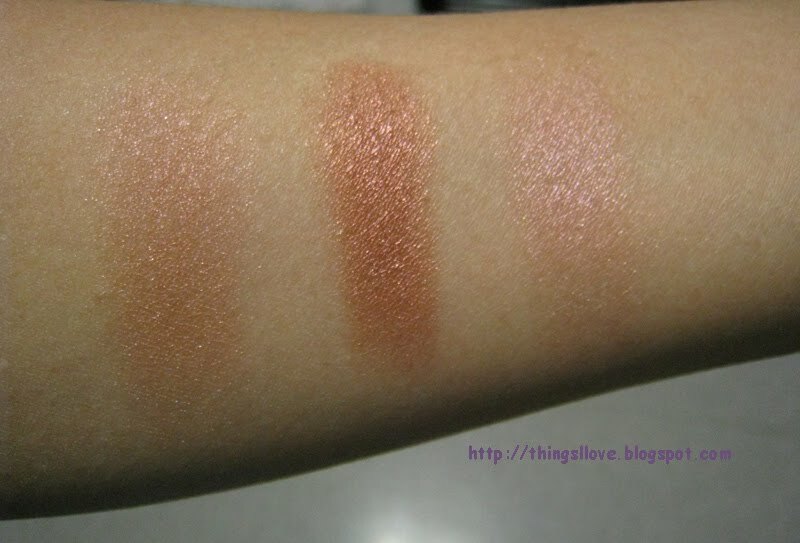 Below are 3 swatches of the product: the typical blended colour, another where I picked up more of the burgundy/bronze pigment and the third where I mainly picked up on the rosy pink shimmer colour. On skin: as a blush, I find Petticoat overly shimmery/frosty on my skin and accentuated all my pores and skin imperfections (as do all other MSFs). Layered on top of other matte peach blush or bronzers with a light hand using a duo fibre brush (eg. MAC 187 or 131 brush), it gives the right amount of glow and gives me that radiant awake look, especially after an hour or so when it has settled down on the skin - perfect for hiding the fact I didn't get enough sleep the night before. I didn't initially love the colour, but have fallen head over heels with it over the last few days after figuring out how to layer with it other blushes so I will definitely be giving it plenty more of my love. In the Groove have quite a few pretty items in the collection, so I may go back to pick up a few items later, namely New vibe duo blush and By Candlelight MSF. If you haven't checked it out yourself - run, don't walk to a MAC counter as the popular items are selling fast (I heard that the Jazzed Lipstick is going out like hotcakes and almost sold out as well). I recently purchased the petticoat MSF as well and as much as I love the colour of it, I am kind of disappointed with the colour pay off on my skin.. Mine doen't have much veining in it so maybe thats the reason or maybe I'm putting it on wrong? I find it gives other colours an a pretty glow if used on top of similar family colour blushes. you could try layering on top of a dusky or rosy colour blush to get a stronger colour.